It's Halloween time! 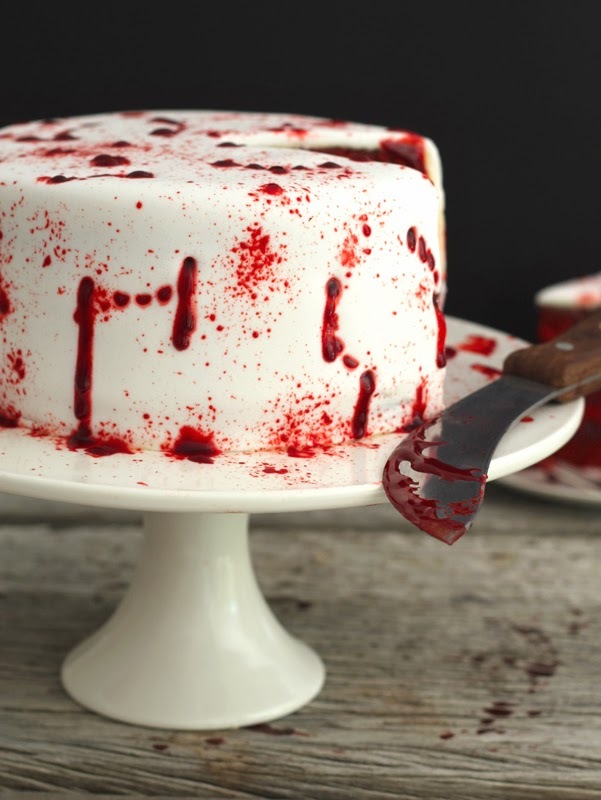 I thought a vampire themed cake would be fitting this year as I spent most of my spare time reading vampire stories when I should have been writing blog posts. Its started with the Sookie Stackhouse (SVM/True Blood) books, then when the ending of those was an epic disappointment I moved on to fan fiction. I've never been one to read fan fiction before, but after stumbling upon Bored to Death from ericizmine I'm hooked. Her stories, the multi-verse, are so intricate and well written that I've read each of them a number of times and am hanging out for new updates. Getting back to Vamp attack cake. 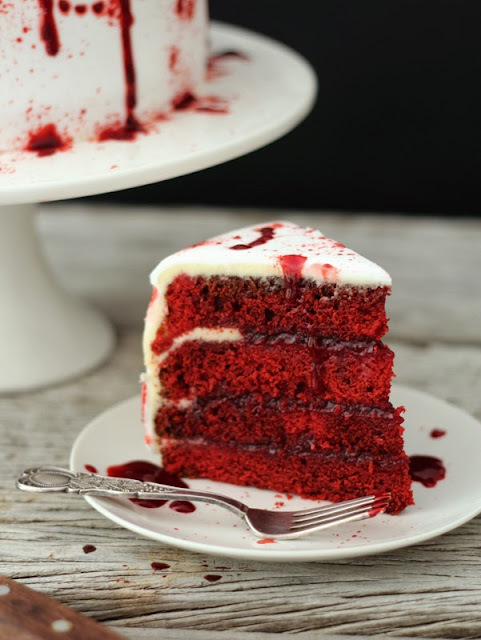 I made a red velvet cake figuring the deep red colour is nice and vampy and perfect for Halloween. The filling added to the look in all its raspberry deliciousness oozy gruesomeness. But the best part about the vamp attack cake? Its pretty simple to decorate. The vampire bites were made easy thanks a set of plastic costume teeth, you know the ones that make you look like your wearing a mouth guard rather than having fangs. 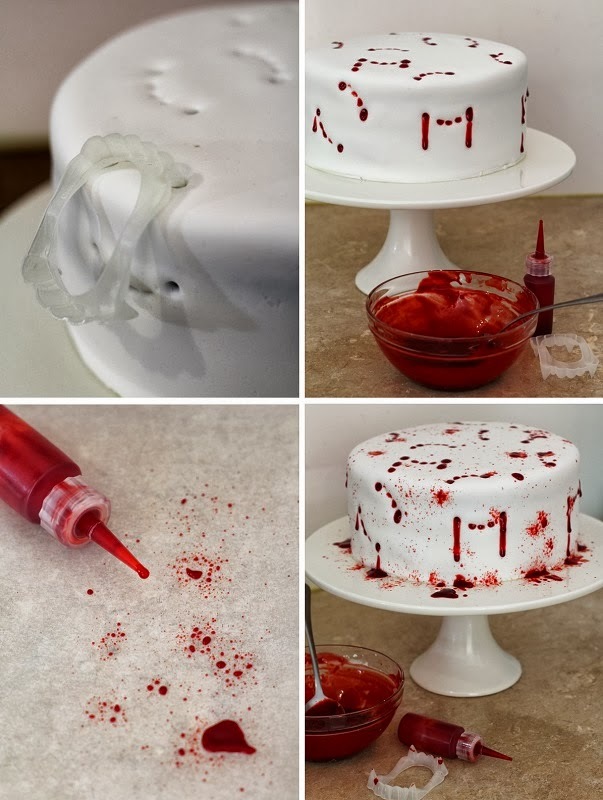 Who knew they'd have other uses than looking dorky, pressing the fake fangs into the outer fondant layer of the cake leaves a prefect bite mark. 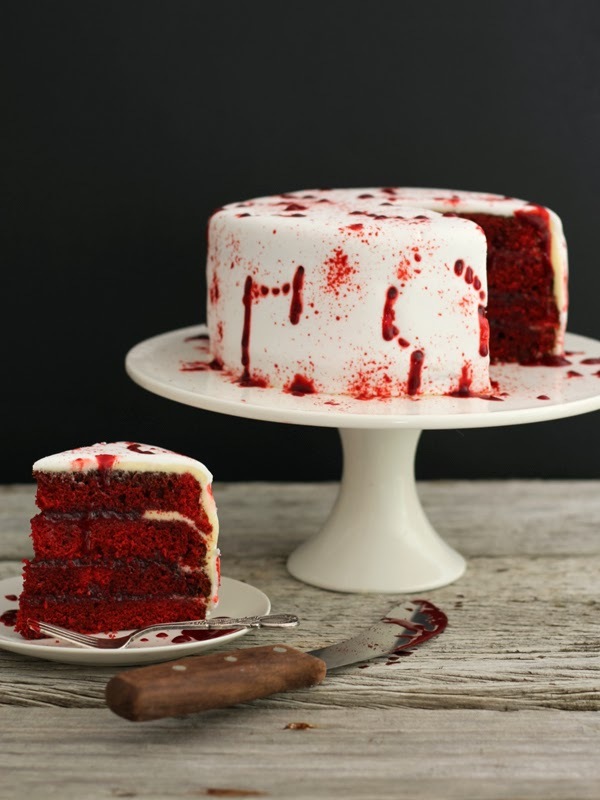 A bit of red makes the bites stand out against the stark white of the cake, giving you a yummy Halloween centrepiece. 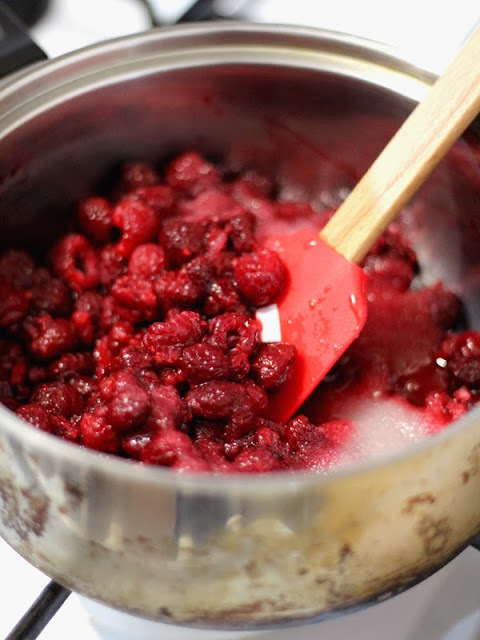 To make the filling- Combine the raspberries, sugar, cornstarch, vanilla and lemon juice in a small saucepan. Cook, until the raspberries begin to break apart and lose their juices. Press the mixture through a fine sieve to remove the majority of the pips, return the strained mixture to the pan, Stir, and cook until the filling boils and thickens (about 5 minutes). Remove from the heat and allow to cool completely. While the filling is cooling make the cakes. Put 2 tablespoons of the filling aside to make the fake blood for the outside of the cake. To make the cake- Preheat your oven to 180°C. Grease and lightly flour two 8 inch cake pans, line the bottoms with baking paper circles and lightly flour the sides. Add the butter and sugar to your mixer bowl, beat on medium until very light and fluffy, it will take a few minutes. Add in the eggs, one at a time, beat well after each addition. 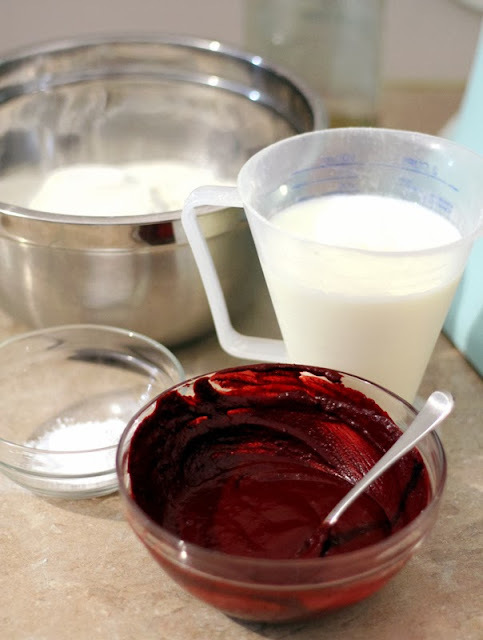 Stir the red food colouring, cocoa, and vanilla in a small bowl to form a paste . Add the red paste to the batter and mix well, evenly dispersing the colour. Mix the salt into the buttermilk. Add a third of the buttermilk and a third of the flour to the batter, beat until just incorporated (do not over beat). Repeat with the remaining thirds. Stir the vinegar and baking soda in a small bowl. Add to the batter and mix well. Scrape down the sides of the bowl making sure all the ingredients are evenly mixed and the batter is smooth. 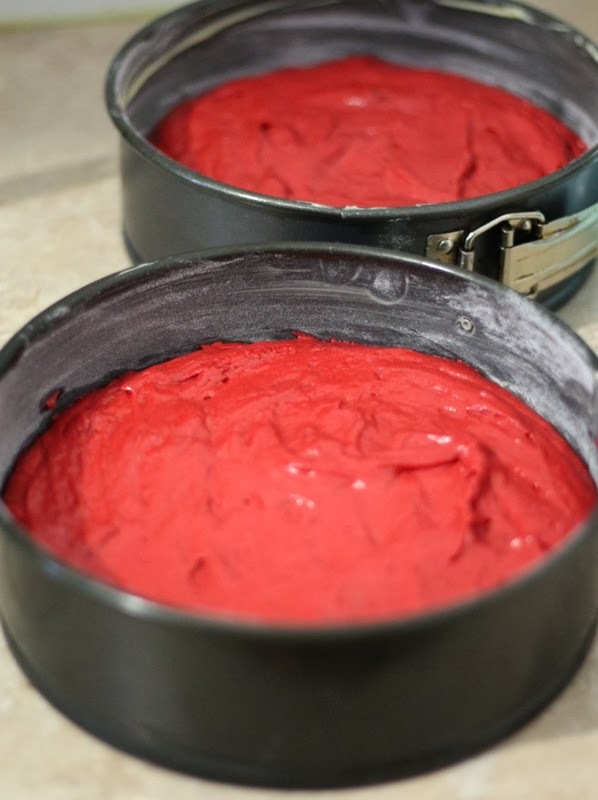 Divide the batter evenly between the two cake tins. 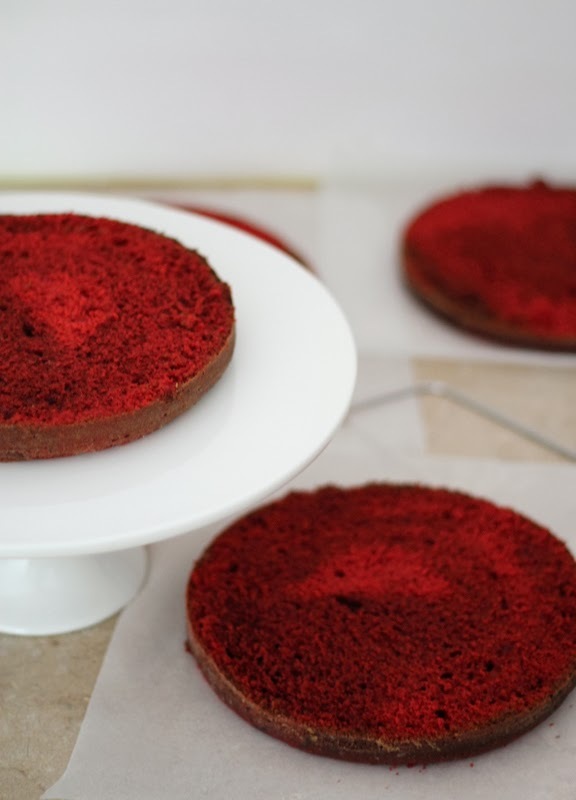 Bake for 40-45 minutes, or until a cake tester inserted in the center of the cake comes out clean. Allow the cakes to cool in the pans for 1 hour. Gently remove the cakes from the tins and allow to cool completely on a wire rack. While the cakes are cooling make the vanilla frosting. 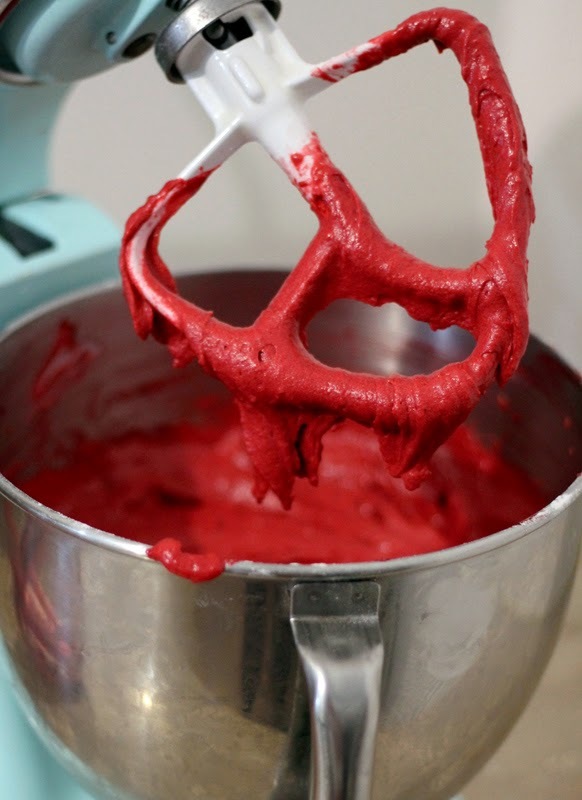 To make the frosting- Beat butter with mixer on medium-high until light and fluffy, about 2 minutes. Switch the speed to low-medium so you don't end up in a cloud of sugar. 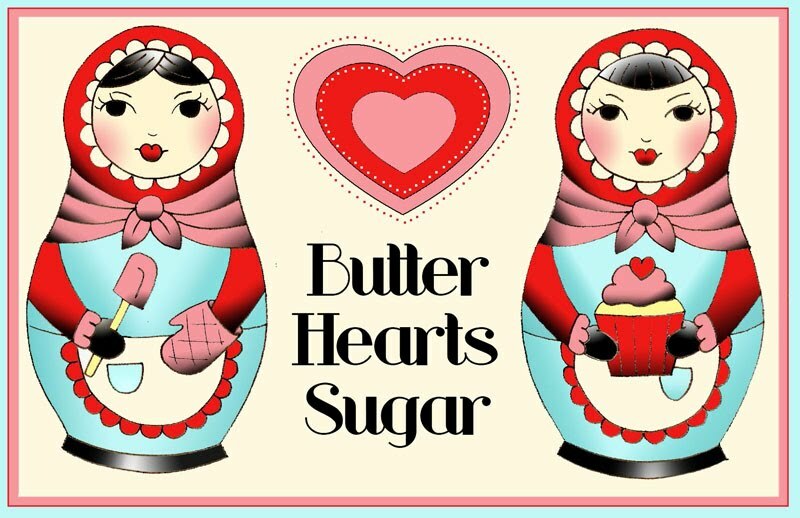 Add the confectioners' sugar, 1/2 cup at a time, beating well after each addition and scraping down the side with a spatula. Add the vanilla and beat frosting on high for about 3 minutes, it will get very pale and be light and airy. If the frosting is too thick beat in a little milk. 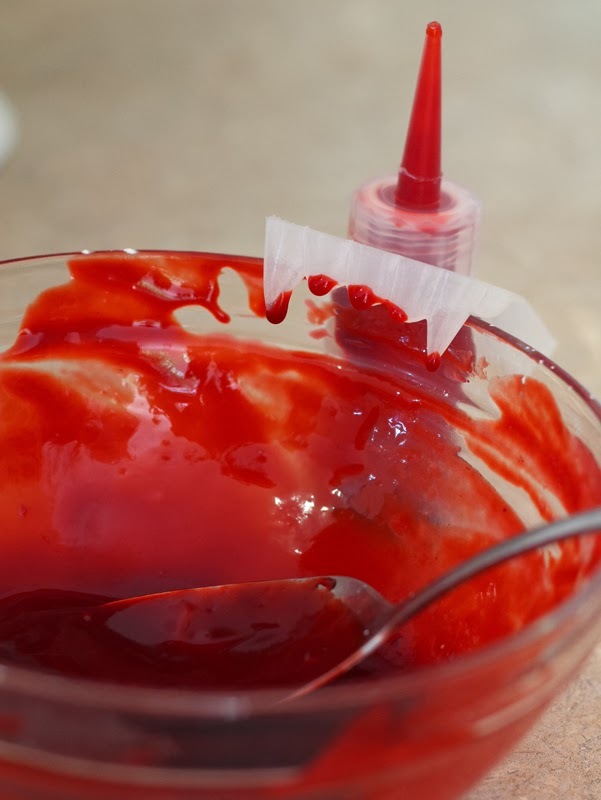 To make the fake blood- Strain the raspberry filling to make sure there are not leftover seeds. Add all ingredients to a small bowl and mix well . 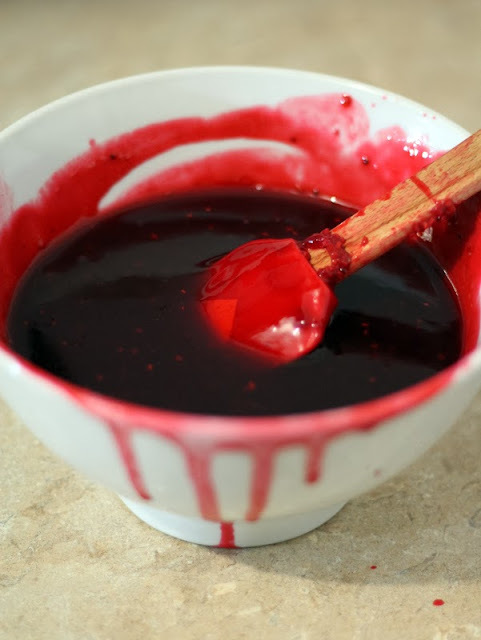 The Chocolate syrup will give the fake blood a bit more realistic colour. Spoon roughly 1/2 of a cup of the vanilla frosting into a piping bag. Place bottom layer of cake onto plate. Pipe a ring of frosting around the edge of the cake to stop the raspberry filling escaping. Spoon in a third for the raspberry frosting and smooth over. Top with the next layer of cake and repeat the piping and filling, finishing with the top layer of cake. 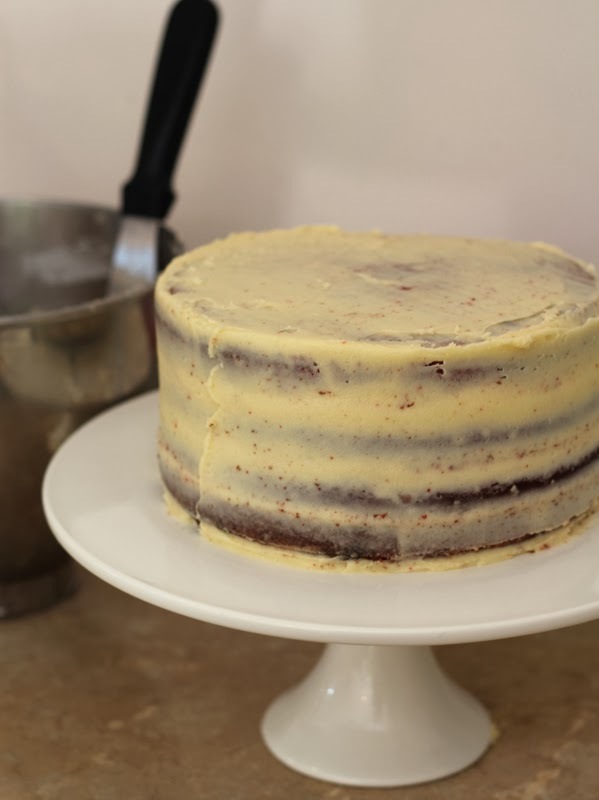 Spread a thin crumb coat of vanilla frosting over the entire cake. Spoon on the remaining frosting and spread in a thicker smooth layer over the entire cake. Dust your work surface (I use a silicone mat) with a little cornflour and roll out the fondant to roughly 7mm thickness. Drape the rolled fondant over the cake. Smooth the fondant over the cake, starting at the top then working down the sides. 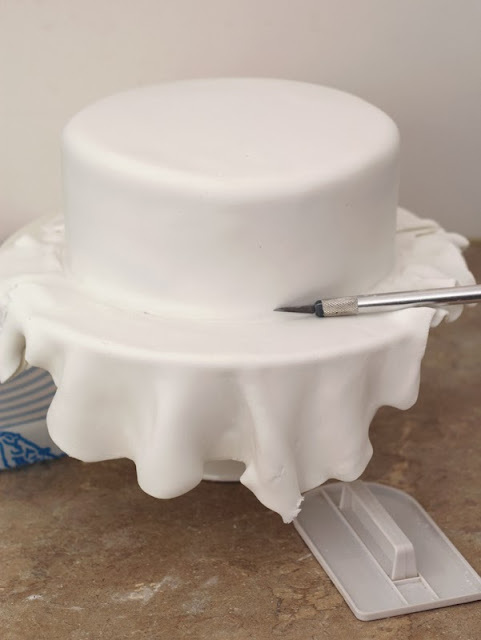 Pull the fondant away from the cake sides as necessary to avoid creases forming. Run the fondant smoothers over the top and around the sides to get a nice flat Finish. Trim the excess fondant from the base of the cake with a sharp knife. Now for the fun part. Press fang marks all over the cake using the plastic teeth. Spoon some of the raspberry chocolate 'blood' into a small squeesy bottle. Fill each of the teeth marks with a little fake blood. Add drips and puddles where you like. To make the spray splatter look, start by placing the cake on top of newspaper to ensure you do not make a mess. Make sure you cover the wall behind too. Empty most of the remaining raspberry chocolate sauce from the squeezy bottle.The little bit of sauce left the the bottle should squeeze out in a splatter. The less sauce in the bottle the finer the spray with be. Go crazy and cover the cake as much as you like. Have A fantastic Halloween Weekend!! What a great idea for a Hallowe'en cake. I especially love the oozing raspberry filling. I think the sign of a really good Halloween cake is one that can turn you a bit... and this has got me feeling a bit light headed! 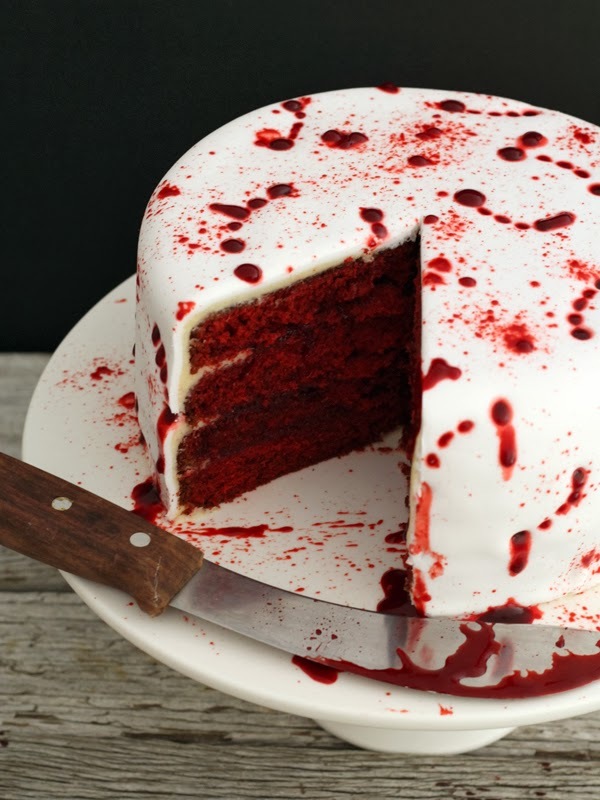 Love the 'blood' against the brilliant white of the cake. Hello !!! 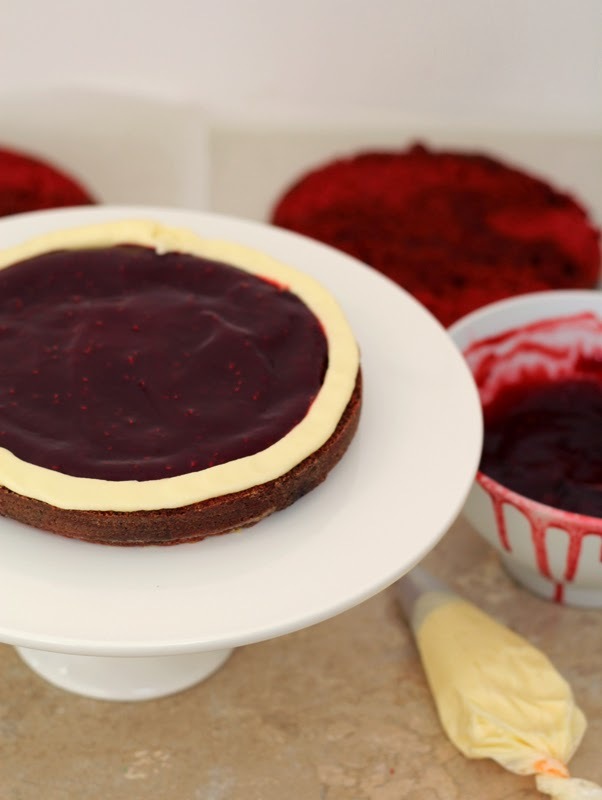 with your permission, I have versioning your Vamp Attack Cake recipe and I leave the link in my post, say that I loved the result so delicious and so terrifying that did it, was surprised the whole family !!!. Congratulations and see you soon !!!! Does fondant have to be used? Can the vanilla frosting just serve as the base?